A follow-up to 2015’s semi-hit Goosebumps, 2018’s Goosebumps 2 returns us to the world created by author RL Stine. While “Stine” himself played a major part in the first film, the sequel largely leaves him offscreen. But not forgotten, as teens Sonny (Jeremy Ray Taylor) and Sam (Caleel Harris) take their burgeoning trash cleanup business to tidy up an abandoned home. This turns out to be the abode in which Stine used to live, and some remnants of his career remain. In particular, Sonny and Sam find a locked manuscript. When they manage to open it, they release Slappy (voiced by Mick Wingert), a malevolent ventriloquist dummy who goes on to unleash all forms of monsters. Along with Sonny’s older sister Sarah (Madison Iseman), the boys seek to capture the creatures and restore order. No one will ever claim the first Goosebumps turned into a classic, but it still created a fairly entertaining experience. It managed to blend fantasy, horror and comedy into one largely appealing package. While Goosebumps 2 attempts the same melange of genres, it proves considerably less successful. Nothing about the movie flops, but the overall result tends to feel generic and forgettable. On one hand, I appreciate that the movie branches out from the first flick and doesn’t just rehash the same situations and characters. We get a potentially fun expansion of the film’s universe, with new circumstances and adventures. On the other hand, Goosebumps 2 doesn’t manage to do a lot with these fresh possibilities. Given the breadth of the Stine universe, the movie enjoys tons of room for lively antics, but it tends to seem simple and bland. Even with all the new characters, Goosebumps 2 feels like a rehash of the first film to some degree. While it develops the supernatural threat in a different manner, it still winds up with a small town stalked by evil creatures, all of whom need to be stopped by kids who understand the nature of the problem. That’s essentially the same plot to the 2015 movie, and we find some of the same critters as well. Again, Goosebumps 2 branches out enough so that it doesn’t quite turn into a remake, but it doesn’t open up to the degree that it comes across as fresh. In addition, the sequel’s cast doesn’t compare favorably with its predecessor’s. We get a handful of comedic talents like Wendi McLendon-Covey, Ken Jeong and Chris Parnell, but all play small roles, and none of them manage to bring a lot to the enterprise. The absence of Black – or someone of similar caliber – becomes an issue. While the three young actors at the core offer more than competent performances, none of them can carry the tale in a positive manner. If the fantasy side of Goosebumps 2 fared better, these factors would matter less, but the story’s creatures and magic lack real vivacity. No matter how much mayhem occurs, the film fails to capture a sense of threat, fun or excitement, so it just kind of sputters along. As family-oriented “light horror”, Goosebumps 2 could work worse than it does, but that doesn’t become high praise. The film feels watchable at best and never threatens to offer a vivid adventure. Title footnote: when it hit movie screens, Goosebumps 2 came with the subtitle Haunted Halloween. The home video release loses the reference to Halloween, presumably to make it look more “saleable” given its January release date. 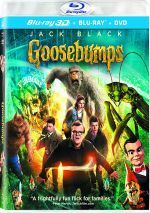 Goosebumps 2 appears in an aspect ratio of approximately 2.39:1 on this 4K UHD Disc. The movie came with a positive presentation. Sharpness became a strength. Virtually no softness impacted a few wider shots, so the image usually offered tight, concise visuals. I saw no issues with jagged edges or shimmering, and the movie lacked both edge haloes and print flaws. Due to its Halloween setting, the film tended toward a somewhat subdued palette, with a moderate emphasis on the usual orange and teal. The colors looked well-rendered given the design choices, and a few more dynamic hues added life. The 4K UHD’s HDR capabilities gave the tones added vivacity as well. Blacks were fine, while shadows seemed smooth and concise. Again, the HDR meant that we got bright whites and strong contrast. Across the board, this turned into a satisfying image. While not exceptional, the Dolby Atmos soundtrack of Goosebumps 2 suited the material. Downconverted to Dolby TrueHD 7.1, the soundscape offered enough action-oriented sequences to add pep to the package. These used the five channels well and meshed together in a positive manner. I couldn’t cite any especially memorable segments, but the track had enough good activity and integration to succeed. Audio quality seemed fine. Speech consistently remained natural and distinctive, without edginess or other problems. Music displayed nice range and clarity, while effects showed solid definition and accuracy. This was a solid “B+” mix. How did the 4K UHD compare to the Blu-ray version? The 4K’s Atmos mix managed a bit more involvement and range than the BD’s DTS-HD MA 5.1 track. Visuals also showed an upgrade, as the 4K appeared better defined and more vivid, with brighter hues and whites. The 4K turned into a moderate step up over the Blu-ray. No extras appear on the 4K itself, but the included Blu-ray copy throws out some components, and these start with a Gag Reel. It goes for two minutes, 37 seconds and provides a fairly standard allotment of goofs and giggles, though a few improv lines add mirth. Three Deleted Scenes follow, as we get “Tommy the Ice Skater” (0:57), “Mr. Chu’s Porch” (0:50) and “Pumpkin Man” (0:39). As one can infer from the brief running times, the clips offer minor expansions, but they’re all reasonably amusing. A few featurettes follow, and Thrills & Chills lasts nine minutes, 56 seconds and offers notes from director Ari Sandel, author RL Stine, producer Deborah Forte, screenwriter Rob Lieber, executive producer Timothy M. Bourne, production designer Rusty Smith, and actors Chris Parnell, Ken Jeong, Wendi McLendon-Covey, Madison Iseman, Jeremy Ray Taylor, and Caleel Harris. “Thrills” examines the source and adaptation, story and characters, cast and performances, Sandel’s impact on the production, sets and locations. Though superficial, “Thrills” brings a mix of decent notes. With Meet the Monsters, we get an eight-minute, 32-second show with Iseman, Taylor, Sandel, Harris, McLendon-Covey, Parnell, Bourne, VFX supervisor Derek Spears, costume designer Salvador Perez, makeup department head Travis Pates, and creature effects makeup department head Matt Sprunger. As implied, the program discusses the supernatural creatures we find in the film and how they came to the screen. Though it leans toward praise, it gives us some useful details. Next comes Science with Slappy, a compilation of five sequences. These fill a total of 11 minutes, nine seconds and include demonstrations with Iseman, Harris and Taylor as well as “Slappy”. They show a few scientific experiments connected to the film. The clips become fairly fun, especially for kids. Three Slappy-Oke Sing Alongs follow: “Take Me Out of the Manuscript”, “Where Is Slappy?” and “Slappy Spells”. In these, Slappy sings tunes and we can follow along with onscreen lyrics. Nothing exciting appears, but I appreciate the novelty of the Slappy-centric songs. We get more from the puppet via Slappy’s Audition. It runs two minutes and gives us a phony screen test. Decent amusement results. Junk Brothers - Call Now! goes for one minute, 13 seconds and provides an “ad” for the kids’ cleanup business. Like “Audition”, it creates an enjoyable piece. The Blu-ray opens with ads for Spider-Man: Into the Spider-Verse, Hotel Transylvania 3, Alpha, Goosebumps and Peter Rabbit. No trailer for Goosebumps 2 appears here. Because the first film offered a fun adventure, I hoped Goosebumps 2 would become another winner. However, the movie tends to drag and it never creates a tale with much imagination or spark. The 4K UHD comes with excellent picture and audio as well as a decent compilation of bonus materials. Goosebumps 2 delivers an ordinary comedy-horror tale, albeit one that looks and sounds good on this 4K UHD.